We have a late Easter this year, and the Lenten season begins on March 1st. That is just 7 days from now. Whether you are a long observer of Lent, or new to the idea, this book Grace and Hope is an excellent addition to your Lent observance. Lent is a 40 day journey of self reflection and self denial as you prepare for Holy Week. I am not typically on to give up meat on Fridays, or quit drinking coffee for 40 days. I like to add something into my 40 day journey rather than give up something. I like to add something that significantly improves my relationship with Christ and prepares my heart for the celebration of His death and resurrection. This devotional study is just the thing to start with. 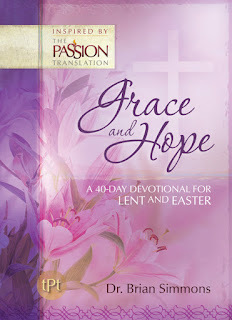 Each day begins with a scripture from The Passion Translation. This translation is geared for the modern English speaking world, to bring the scriptures back to life in a way we can understand. After the scripture reading, there is devotional by Dr. Brian Simmons. Each devotion focused on Jesus. Finally their is a Lenten prayer. Each day is numbered rather than dated, so you can use this devotional each year. Pick up a copy from Broadstreet Publishing and make this a Lent to really appreciate all that our Savior has done for us.